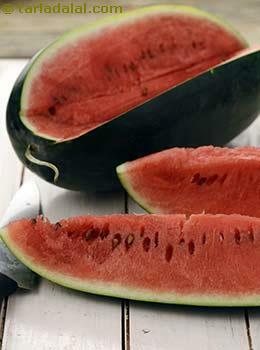 Favorite fruit for many, watermelon is loaded with innumerable nutritious value. It is an excellent source of lycopene which helps to reduce cardiovascular disease risk. The high glycemic index of watermelon .i.e. 76 is a great concern for the people trying to manage blood sugar levels. But the key is distributing the amount of carbohydrate content appropriately throughout the day which will maintain the sugar levels. This is better understood by glycemic load which is 4.2 for approximately 1 cup of chopped watermelon. Is Watermelon Safe for Diabetics? You may wonder how watermelon is suggested for diabetics! So the reason behind this is watermelon is safe for diabetics because of its low glycemic load, even though its glycemic index is 76. The major attention should be given is to the amount of carbohydrate consumed at a time and how it is divided throughout the day. As 1 cup of chopped watermelon has only 5.5 grams of carbohydrate which will not allow your blood sugar levels to fluctuate. Is Watermelon Suitable for Weight Loss? Watermelon comes as an amazing fruit for all the weight watchers, even though it is sweet it is very low in calories .i.e. around 30 calories for 1 cup of chopped watermelon. It contains negligible amount of fats and has 90% of water content which is filling and gives rejuvenating effect. So when next time you crave for something which is sweet but low in calories, choose watermelon! Remember anything in excess will reduce the effect of your weight loss regime.